next post: Those Imbecilic Keynesianisticists are loose – lock up your … whatever! I was reminded this week of an interesting studies published in 1987 by Arjo Klamer and David Colander on the influences that go into the training of a professional economist. This study was repeated by Colander in 2005. The results are rather disturbing although obviously I am an ‘insider’ in the sense I went through the process in one way or another myself (although not in a US graduate program). They demonstrate how far removed graduate students are from learning or being interested in the real world. They compete among each other for ‘technical excellence’ in mathematics so they can solve tricky technical problems but do not think it is important to know anything much about the real world economy nor about the economics literature and history of the discipline that has gone before them. They adopt classic Groupthink characteristics as they are moulded (socialised, brainwashed, choose your own word) by their professors (who then feed them into their own networks for employment etc). There is little wonder the profession has very little to say that makes any sense about the real world. It is largely a disgrace. Clearly, I have been through this mill myself. It was quite torrid though being a non-orthodox thinker getting through the process where homogenisation is largely expected and enforced (through grades if nothing else). In my case, I was good at mathematics and statistics and read widely so I found the orthodox material to be easy. This meant I could get top grades, given the technical nature of the mainstream material (especially in graduate studies), and still have plenty of time to read all manner of things in sociology, philosophy, history, political science etc. So I think I came out of it with my humanity somewhat intact. I was also from the ‘other side of the tracks’, whereas most of my class mates were from well-to-do backgrounds, mostly from private schools and higher income suburbs. So I already knew there was inequality and poverty and that unemployment ravaged households. The first study by Arjo Klamer and David Colander – The Making of an Economist – was published in the economics journal Journal of Economic Perspectives (Vol.1, No.2) in the northern Fall of 1987. The second study by David Colander – The Making of an Economist Redux – was published in the Journal of Economic Perspectives (Vol.19, No.1) in the northern Winter of 2005. … the initiation process that turns students into professional economists. I think the term “initiation” is somewhat euphemistic. Departments of economics are graduating a generation of idiots savants, brilliant at esoteric mathematics yet innocent of actual economic life. And that is definitely being euphemistic. I have written about how economics programs at university level nurture sociopathological tendencies in the students. 1. Economics curriculum is needed to work against selfishness and for altruism (September 19, 2018). 2. Humans are intrinsically anti neo-liberal (May 22, 2017). Arjo Klamer and David Colander thus set out to examine what goes on in ‘graduate schools’ of economics in order to understand why economists engage in public discourse in the way that they do. They compiled a database from a survey of “six top-ranking graduate economic programs—University of Chicago, Columbia University, Harvard University, Massachusetts Institute of Technology, Stanford University, and Yale University”. They followed up with face-to-face interviews. 1. “The typical graduate student in economics at these selected institutions is a 26-year-old, middle class, nonreligious white male who is involved in a long-term relationship” (18.9 per cent were female). This sort of profile is similar to many graduate programs that I have been aware of. 5. Peer group pressure was strong and militated against taken jobs with lower wages or less status (such as in public policy work). That question provided some of the most dramatic results of our survey. 1. “Knowledge of the economy and knowledge of economic literature do not make an economist successful, according to graduate students”. In the interviews that followed, the students confirmed this result. Clearly these results raise significant questions about the nature of graduate school, what is being taught, and the socialization process that occurs. The most important things governing perceptions of success were “Being smart in the sense of being good at problem-solving” and “Excellence in mathematics”. Which raises the question – what problems are being solved? Certainly not those that relate much to the real world. Graduate students are trained to follow these ‘haiku-like’ rules, that govern an economics paper’s chance of publication success. So if an article submission does not conform to this haiku-like structure it has a significantly diminished chance of publication. Assert without foundation – so-called micro-foundations – rationality, maximisation, RATEX. Cannot deal with real world people so deal with one infinitely-lived agent! Assert efficient, competitive markets as optimality benchmark. Write some trivial mathematical equations and solve. Policy shock ‘solution’ to ‘prove’, for example, that fiscal policy ineffective (Ricardian equivalence) and austerity is good. Perhaps allow some short-run stimulus effect. Get some data – realise poor fit – add some ad hoc lags (price stickiness etc) to improve ‘fit’ but end up with identical long-term results. Maintain pretense that micro-foundations are intact – after all it is the only claim to intellectual authority. Knowledge quotient – ZERO – GIGO. This is why the publication bias problem in mainstream macroeconomics is so significant. … but it is technical problem-solving which has more to do with formal modeling techniques than with real world problems. To do the problems little real world knowledge of institutions is needed, and in many cases such knowledge would actually be a hindrance since the simplifying assumptions would be harder to accept. a strong sense that economics was a game and that hard work in devising relevant models that demonstrated a deep understanding of institutions would have a lower payoff than devising models that were analytically neat; the facade, not the depth of knowledge, was important. … graduate students tend to qualify their conclusions … much more than do most American economists. If you really know your theory, the policy implications are pretty straightforward. It’s not really the really challenging meat and potato stuff for a really sharp theorist. This is a really outrageous statement. Because it suggests that an abstract theory, which is not even consistent internally, and lacks any correspondence to the real world, can deliver anything that will help governments advance the well-being of people. The theory in question delivers self-fulfilling outcomes through the internal logic of the ‘theory’. If we set up the experiment such that the basic assumption is that Policy X will cause harm and then find Policy X causes harm in the constrained abstract world we play around with and think we have said anything about the real world then we are deluding ourselves. The Groupthink that dominates mainstream economics blinds the participants to any realisation of how far removed they are from the reality they, ultimately, prognosticate about. While I use the term Groupthink, Klamer and Colander refer to a “socialisation process” that permeates graduate school economics. Other words include: indoctrination, brainwashing … take your pick. In the followup article – The Making of an Economist Redux – published in 2005, David Colander sought to update the earlier study. Not much had changed with the profile of the students surveyed and interviewed. 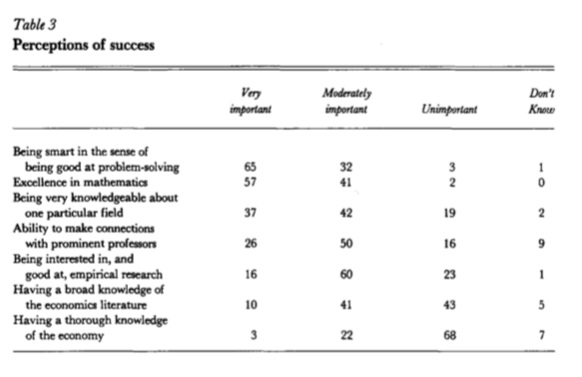 There were some changes in the “Perceptions of Success” outcomes. Here is a comparison of the 1987 and 2005 outcomes (Table 1 from David Colander’s paper). The author says that the Table “summarizes my perception of the changes that have occurred in the profession over the last 15 years … Economics … has become more consciously empirical”. Refer back to my haiku list as to what that actually means. One cannot, for example, do any sensible empirical work on financial stability, if there is no financial sector in the major models that inform the empirical analysis. That was the case of the dominant New Keynesian approach to macroeconomics – no banks, no unemployment. One can do ’empirical work’ until the cows come home but if one is just ‘counting the number of angels on the top of a pinhead’ then there is little worth to come from it. 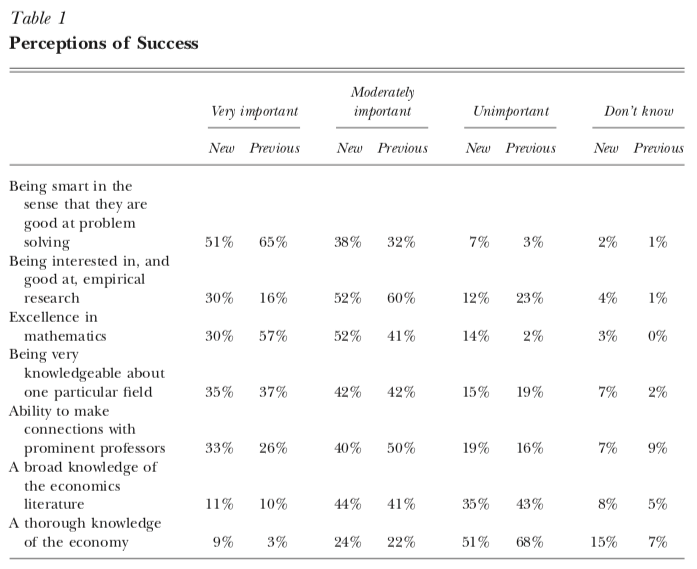 As you see in the last Table, a majority of graduate students in economics do not think a thorough knowledge of the economy to be important. … the differences in policy views on macro that showed up in the survey did not reflect what they were taught about policy in macro, since they were taught almost nothing about macro policy, but reflected their undergraduate training. Which is a dire result. The simplistic undergraduate approach to macroeconomics delivers the sort of trash that we read in financial columns. You know with headlines like Zimbabwe, and now, Venezuela. The fact that macroeconomics is not necessarily considered part of “core” learning in economics and that “Eliminating macro from the core would free up resources” is a desperate thought. Each day, the news stories are about macroeconomics. Mass unemployment is a macro outcome. You cannot understand a systemic failure to create enough jobs by studying microeconomics, which tells us that all outcomes are the result of individual maximising behaviour in the face of income constraints. I am hoping that the work the core MMT group have been doing over the last 25 odd years will eventually permeate into the mainstream curriculum. Our textbook comes out in a week or so. It is a two-year sequence in macroeconomics – full of theory, history, rhetoric, techniques, and policy. I hope to be able to launch the MMT University Project later in the year if I can raise sufficient funding. I will be conducting classes at the University of Helsinki on February 26-28 and March 5-7 in Modern Monetary Theory (MMT) using the book. While the lectures are part of a university degree (in my role as Professor of Global Political Economy at the University of Helsinki) – they are open to the public and I would welcome anyone to attend. It is now likely that I will also be in London to launch our text book on Friday, March 1 – more details to follow. There is hope as we duck and weave on a daily basis these days as the Zimbabwe or Venezuela darts come flying at us. Bill, didn’t read through the whole yet, but gotta good laugh from the students about what makes a successful economist – a lack of understanding the economy and a lack of breadth of economic thought. Bravo. We need more real thinkers like you in this world. Knowledge of the economic system is of utmost importance. It is flawed in the USA. I once began a PhD at a well-known Chicago influenced American business school studying accounting. I had a background in accounting, business and economics. My fellow students where mostly math and engineering graduates who had never studied business or economics in their lives. Naturally, the one person who actually knew any theory (i.e. me) simply wasn’t equipped to deal with the advanced mathematics being thrown at me and left. My counterparts no doubt got very good a coming up with empirical tests that proved financial markets are both rational and efficient. I did my A level in one year when I was 17 and started a life-long interest in the subject but knew no one to further that interest until married. My in-laws were trade unionists and socialists, although not well-read. Nor was I well-read – only source was Guardian/Observer. I was 33 with 2 toddlers when I started my degree in 1980, when Thatcher had begun to use unemployment as a deliberate policy to weaken trade unions (I’m aware that monetarism was already embedded). I needed the money – at that time the grant and travel expenses equated to a well-paid part-time job (and it was very much part time). So far in time from any exposure to maths I struggled with econometrics and when I asked the lecturer if he could please slow-down was told that he couldn’t as it would be too boring for him. I didn’t believe anything much that I was taught as it did not correspond to my real experience (struggling with husband’s addictions and money problems). I was appalled with the ‘proof’ of Ricardo’s law of comparative advantage and told the lecturer that it was nonsense – he asked that I appreciate the aesthetics of the graph. The only things I really learned, from my own puny studying, were that land needs to be taxed and that we’re going to destroy the planet. It was not until I met up with the land value tax movement that I started to learn again. The next thing was Steve Keen’s ‘Debunking’ (a xmas present from partner – a communist from whom I learned more) which confirmed long-held suspicions. Lately I’ve come to ‘get’ money (at last) after Richard Murphy’s blog introduced me to MMT. I don’t bother with him now (he blocked me after 15 years of friendship – your fault! ), but have matured to your blogs, Bill, and I’m in communication with the wonderful Gower Girls. They are amazing ‘younger’ women. I’m now excited with the idea of the synergy between the LVT and MMT movements. It is not only unemployment which is a permanent waste to production – it is also usable land which is unused – this I learned from the great Mason Gaffney many years ago. As one of my US LVT colleagues recently asked, when I sent her one of your blogs: “Wouldn’t a lot of that good government expenditure just feed into land values?”. I’ve arranged a discussion meeting on this in London in a couple of weeks. When – in my retirement – I (an arts graduate, never having been taught anything about “economics”) began to try to teach myself something about it I rapidly became convinced that mathematics had nothing to do with it. Call that confirmation bias if you will :-). However, as we all know, the name given to the subject in Victorian times was “political economy” and that to my mind is brilliantly apposite. It crystalises what studying it is supposed to be *for*! From its inception it took the real, *political*, world as its object for which purpose knowledge of advanced mathematics was entirely superfluous. Thus perceived, it belonged quintessentially among what today we term “the humanities”. The rot set in when “economists” began aspiring to be regarded as “scientists”, apparently in an effort to be able to claim equality of esteem (as they saw it) with researchers in the physical sciences – ie motivated just as is the spuriously-named “Nobel Prize in Economics” by competitiveness and the desire for self-aggrandisement. To be a scientist necessitated mathematical expertise, so they set about acquiring it. Having acquired it what were they to do with it? One path lay through statistics – an extremely useful specialised and technical discipline in its own right, with clear applicability in the field (among many others) of “economics”. That was fine. What was anything but fine however was the perversion of “political economy” itself into an exercise in sheer abstraction, requiring that human beings and human society be treated as quantifiable entities in order for equations to be applied to them. From there it was downhill all the way. The wholly malign results can be vividly seen – by no means for the first time – in Klamer’s and Collander’s studies. That advanced students in “political economy”, wholly concerned as it is with human beings and human society, could in all sincerity judge a thorough knowledge of the economy as almost entirely irrelevant, and “being smart at problem-solving” (clearly, from the context, *abstract* problems) as its exact obverse, would have boggled the minds of the founders of the subject – as today it does indeed boggle Bill’s mind, and mine, and anyone else’s not themselves members of the hermetically-sealed, self-referential, cult that is “mainstream economics”. Thank you for sharing that, very uplifting, account. There is a possible silver lining in Table 1 in the final row dealing with a thorough knowledge of the economy. The table indicates a 17% decrease in the number of students who previously thought such knowledge unimportant, from 68% to 51%. Where did they go? I suspect that they might have segued into thinking Don’t Know or Moderately Important. The former increased significantly, though it doesn’t account for all of the fall in the Thorough Knowledge category. Why am I banging on about this? Well, while it isn’t completely insignificant, could it be an incremental step change in the right direction? And it is supported by the Excellence in Math row, which has also indicated a significant decrease from Previous to Now. However, not every entry in the table is in the same direction. So, a mixed bag, as it were. Perhaps it is an indicator that while not all is lost, jubilation may be premature. I have often wondered whether Kuttner’s title for his paper had been influenced by Poppers The Poverty of Historicism, which came out in 1957. Popper’s book became extremely well known. I can not believe that he was not aware of it. This is not a criticism of Kuttner, merely that influences come from diverse sources, oftentimes without a person being aware of it. Yesterday the NYT featured a neoliberal propaganda op ed by Steve Rattner. Today Bloomberg Businessweek featured MMT as one of 7 fixes that can save Capitalism! Let the battle begin in earnest at the highest levels! MMT will win. It is the antidote to the hemlock of neoliberalism. Rebuke noted. You were quite right. Will try not to re-offend. Bill is being kind to orthodox economics. It’s impossible to imagine how this set of beliefs passed to students of orthodox economics could have resulted from some organic evolution of thought; it’s just far too self serving to certain interests, and too disconnected from facts on the ground, ie reality. The historical path of evolution of it’s use as a policy tool puts things in proper perspective. Other fields, psychology, “the science that’s not a science” according to the late physicist Richard Feynman, for example have been chastised for creating their own realities, not learning from their mistakes, not seeking advice from those in intersecting fields, and above all for failing to admit the fundamental role that the mechanics of conscious perception, which no field has a working theory of, plays in behavior; however, academics in orthodox economics remains unsurpassed when it comes to holding fast to it’s theory that allows the practitioner to make up the rules that describe economic behavior. At least there are many practicing clinical psychologists willing to admit that psychology is an “imprecise” science; we don’t see that with economics. “Brexit means we can rebuild” – who said that in March 2017? Let’s suppose you had to look at that statement from opposite ends of the economic (theoretical) spectrum and also from opposite ends of the political spectrum. Both analyses would have to take in the employment prospects (bearing in mind a natural wish to maintain full employment and to formulate a future strategy for UK economic prosperity). Whether you are left or right leaning in these assessments it would be hard to avoid some element of overlap. “Sales of national and local print newspapers roughly halved between 2007 and 2017 while print advertising declined nearly 70%. Most people now receive their news online; the figure is 91% for people aged 18-24…. (media) Investigations of illegal and unethical behaviour by governments, businesses and individuals are costly…and rarely commercially justified”. Whether you are left or right leaning in these assessments it would be hard to avoid some concern at the prospect of what looser scrutiny might engender. Both these extracts go to the heart of what the subject of economics encompasses – because it is much more than a theoretical field of study; it is an enquiry into the morality of human endeavour, something that will not subscribe to or be fully explained by a sophisticated intellectual logic. Humanity exists in a complex and multi-layered format, some of it raw and exploitive, some of it based on compassion and support. The first quote relates to something Arthur Scargill said. The second quote is from today’s issue of The Times. If engineers were educated like mainstream economists then aircraft, cars or consumer goods would fall apart before leaving the factory, chemical plants would blow up or structures would fail while constructing the foundations. Clearly economists are as essential to the economy as speculators, scammers and neoliberal politicians. On order to do so effectively for such a long time, you need highly trained drones that won’t question those “haiku-like” rules and a high turnover rate because brainwashed as the drones might be, they are seldom stupid and those with some moral fibers left in them would surely rock the boat. One of the most common rebuttals to my (relatively) new found convictions on economics (thank you for that, Bill) is that it simply can’t be that so many smart people overlook or don’t understand such a simple principle as “taxes don’t fund anything in a modern economy”. I can’t help but concede that it does sound like a huge conspiracy when one tries to break down the system of revolving doors between faculty members, bank and corporate personnel, consulting firm bosses and drones and high-level government officials deep in the pockets of corporations and how their dealings are hiding in plain sight with the help of paid media, think tanks and indoctrination in academia. what are the chances that such “RANDOM STUPIDIY” could lead to over and over to the benifit of a small group of people over decades? On a theoretical level it is not even hard to understand who and how is behind it all. It is not the Bilderbergers, or the Freemasons, or even Chase Manhattan or Standard Oil. It is the place where unlimited amounts of money, huge amounts of information, and and an ability to blackmail or kill people all come together. All made possible by a population who has been conditioned to follow orders and not ask questions and never doubt the good intentions of ones supiriors of bosses. Not only do taxes not fund anything our personal savings are really not neccessary for the wll being of society either. Sure they are neccessary so that as a family we can buy a more expensive, house, car, boat, or vacation. But these decisions do not correlate to a benifit for society. They correlate to a benifit of one firm over another. Why is this knowledge important. Because people all over the industrialized world people are being manipulated in to investing in private retirement accounts which ties their individual fate in their vulnurable years to a corrupt system that is destroying us. There is no way in hell that a system that was not already corrupted would have allowed that. Such coordiantion could have only be the result of a PREDETERMINED PLAN. Of course there are lots of stupid people who do not understand their role in implementing the plans of the conspiracy. That does not mean they are not playing a role in a conspiracy. After I wrote this I asked myself why does it matter if a person thinks that the things are going wrong as the result of a conspiracy or just plain stupidity. The most that can be done is to fight the bad ideas one by one as they are introduced in either case. Furthermore, to say that what is going on is the result of a conspiracy is devicive. Some people will tune you out. So maybe talking about conspiracy is not a good idea. But if we do not talk about conspiracy will many people continue believe that those in charge are motivated by good intentions? Does it matter if the results that we are getting is the result of stupidity and intellectual laziness or criminal intent? Does it matter if people at the highest levels of the Democratic Party in the USA conspired to prevent Bernie Sanders from being the Democatic nominee? If he had won what are the chances that he would have won the general election? If he had won the general election what are the chances that he would have performed any better than Syriza? I do fell you, though. Stay strong! Congratulations on getting your PhD and becoming an Uncle. I haven’t read Schmidt’s book, so can say nothing about it. However, I do not recognize in your description what I feel can be viewd as an overgeneralization. I have experienced what you describe, but not everywhere or in every program. Leaving out economics, which I would argue is a special case, there is a distinction to be made between mastering the basics so you can read the literature and then contribute to it and being brainwashed. I am sorry that you felt that you were being brainwashed. It is not the most productive way to master a field.